History To turn a ground-breaking idea into a successful enterprise requires leadership that is aggressive, determined, and totally committed. The founders of the Finnish Credit Union in Toronto fortunately included two families with the necessary qualifications. Esko Oskar Iivarinen, born near Käkisalmi in Karelia, came to Toronto in 1951 and went into business almost instantly. His wife, Tamara, was born in Estonia and had escaped on the last ship to leave Paldiski for Helsinki before the Soviet occupation in 1944. Tamara, who had worked first at the Royal Bank and later the TD Bank, in Toronto was the only founding member with any previous banking experience. Orvokki Jalava and Paavo Hyttinen were also present but, because they acted as witnesses to the signatures, their names could not be registered as founders. Raye was elected as the first chairman and Mauri Jalava as secretary/treasurer. The official address of the credit union was listed as Mauri and Ansa’s home. Mauri, his mother Orvokki and Ansa’s brother Paavo Hyttinen filed the official documents on January 6, 1958 at the office of Ontario Credit Union League. The Finnish (Toronto) Credit Union became the League's newest member. An important discussion went on amongst the founders of the fledgling credit union concerning the criteria for membership. It was decided that membership should be open to all Finns, their spouses and their children: the only requirement would be Finnish identity. The government decided to accept the credit union’s application on February 6th, 1958 and so for all practical purposes, this is the official date of inception of the Finnish (Toronto) Credit Union Ltd. Decades later Raye said that getting the definition of membership based on ethnicity was his greatest service to the Finnish Credit Union. Under the common law, it became a precedent that could subsequently be cited by other groups. Credit unions established by associations or faith-based communities can limit membership on the basis of political or other considerations and company credit unions survive only as long as the company remains in business. A credit union based on ethnicity, on the other hand, remains open to anybody in the province who belongs to the cultural group with no other strings attached. Furthermore, to have access to a financial institution where your own language is spoken is very important. The AGM of 2004 approved a change to the official name in English from the Finnish (Toronto) Credit Union Limited to simply the Finnish Credit Union Limited. Omitting "Toronto" from the name was to emphasize the fact that it is the only credit union in Ontario dedicated exclusively to serving the Finnish population. Regulations set out in the Credit Union and Caisses Populaires Act of Ontario allowed any credit union to accept up to three percent of members from outside of its affinity group. Osuuspankki's quota of non-Finnish members was soon filled. 2008 was the 50th Anniversary of the Finnish Credit Union Limited. During the last few years, General Manager Antero Elo has nurtured his relations with the Finnish and European business communities of Toronto. Osuuspankki has co-hosted receptions in cooperation with the EU Chamber of Commerce, sponsored the Canada-Finland Chamber of Commerce's selection of Finnish Entrepreneur of the Year, and hosted monthly breakfast meetings for Finnish business leaders. The Credit Union's Finnish identity is as important today as it was at its inception. 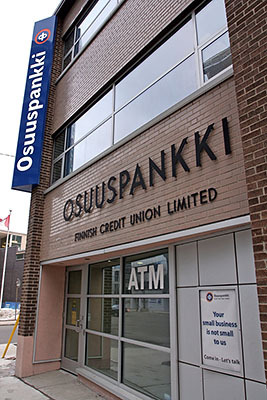 The outside of the branch facing Eglinton Avenue displays a proud blue and white sign with vertical letters that spell OSUUSPANKKI – unmistakeably in Finnish.